While Rockhounding on Public Lands, mostly in the Western States, and on private lands, with the permission of the land owner, be aware that the M-44 in use in areas where coyote, feral dogs and other predator wildlife are a threat to grazing livestock and domestic farm and ranch animals. If a M-44 devise is found, “Let it Be”, Do not touch, consider it as a “Live Bomb” – because it is and it can Kill People and domestic dogs! Safety tips for people to follow are talked about, discussed and even published. Some people are trained to take care of most dangers that are encountered while hiking, camping and, yes, even rock hunting. One danger that I have never seen on a list of safety tips out there is the M-44. 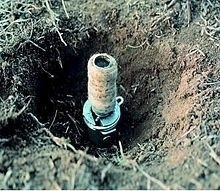 In some areas where Rock Hounds are, there may be an M-44 "cyanide bomb", which is EXTREMELY LETHAL! The M-44 consists of a capsule holder, a cyanide capsule, a spring-activated ejector, and a stake. Bilingual signs warn about the device. The M-44 device uses a cyanide capsule that is registered as a restricted-use pesticide by the Environmental Protection Agency (EPA). can be used only by trained certified applicators. Wildlife Service Officers are authorized to use M-44 cyanide capsules to control coyotes, wild (feral) dogs, and red, gray, and arctic foxes which are: suspected of preying upon livestock, poultry, or federally designated threatened and endangered species; or are vectors of communicable disease. The program’s use of M-44 devices strictly conforms to EPA label instructions, directions, and use-restrictions; applicable Federal, State, and local laws and regulations; and agency and program directives and policies. Wildlife Service personnel do not use M-44s on any property unless requested by the land’s owner or manager; a valid written cooperative agreement, agreement for control, Memoranda of Agreement, or other applicable document must be in place. Bottom Line: When Rockhounding, be aware of your surroundings and if one of these M-44 devices are found, keep away. If you have your pets with you, be sure to keep a close eye on them. Pet dogs have been known to find and set off these devices and in most cases it is fatal for your family pet.